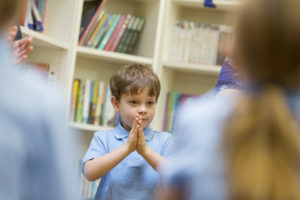 My sons attend a non-religious, council-funded school. I have been consistently surprised by the RE teaching in the school and the bias given to Christianity. There have been numerous trips to places of worship, but all of these have been Christian. To my knowledge, my oldest son, in year 2, has learned about Diwali and Eid el Fitr. I’m quite sure these are always prefaced with “Hindus believe…” or “Muslims believe…” I’m not sure it is always taught the same way with the Christian stories. My youngest son comes home and tells me the stories in a way that makes me think he gives them the same credence as the other fact or evidence based lessons. He has come home and said he wanted to die so he could go to heaven and be with his granddad, who passed away in 2012. He has never been taught about heaven at home. As a humanist I have talked about death as a natural part of life only. Although we have fantasised about fusing our consciousnesses with computers and living forever! There are subtle ways in which the Christian point of view is enforced by the head teacher. For example she has stood up after the obligatory nativity show at the end of the year and said it heartens her to see the nativity story and remember the real meaning and message of Christmas. My oldest son attended the local Baptist church for his nativity story with songs. During this production a video was displayed showing an updated version of the nativity story showing children dressed as wise men travelling on scooters and posting the birth of Jesus on social media. King Herod read about it on his tablet and was very angry. Afterwards the preacher talked about the story as if it were fact and encouraged children to come to the special Christmas Day service where they show off their toys and fly drones around the room. A few of the children later tried to influence their parents to attend as the preacher was an incredibly charismatic speaker and they really wanted to join in the fun. Each class does assemblies in rotation. At the end of each of these the children are asked to bow their heads and pray. I have said to both my children that this is not compulsory and that sitting quietly and respectfully is perfectly acceptable. If they wish to bow their heads in quiet contemplation it is up to them. Indeed if they wish to pray it is up to them as well. My youngest became very concerned and felt he would be in trouble and sent to the head teacher if he didn’t comply. Clearly it has not been promoted as optional. I challenged his teacher about the booklet yesterday who defended their decision to invite a church in to talk about Easter as it is part of the story of Easter and we live in a majority Christian country. It’s as if the school thinks it is perfectly acceptable for them to hand out Christian propaganda to my impressionable young child. I have spoken to other mums about this and they agree with my point of view and observations. One of their children was quite upset by the idea that a man could come back to life after being killed so brutally. Clearly it wasn’t taught to him as if it is the belief of Christians and a story.